Repeated implantation failure (RIF) is determined when embryos of good quality fail to implant following several in vitro fertilization (IVF) treatment cycles. Implantation failure is related to either maternal factors or embryonic causes. Maternal factors include uterine anatomic abnormalities, thrombophilia, non-receptive endometrium and immunological factors. Failure of implantation due to embryonic causes is associated with either genetic abnormalities or other factors intrinsic to the embryo that impair its ability to develop in uterus, to hatch and to implant. New methods of time-lapse imaging of embryos and assessment of their metabolic functions may improve selection of embryos for transfer, and subsequent outcomes for IVF patients, as well as for those diagnosed with repeated implantation failure. The process of implantation involves two main components, a healthy embryo that should have the potential to implant and a receptive endometrium that should enable implantation. The “cross-talk” between the embryo and the endometrium that finally leads to apposition, attachment and invasion of embryos is mandatory for successful implantation and subsequent normal placentation. These processes are under thorough investigation and seem to involve many mediators originating in the embryo, as well as in the endometrium, and to also involve the maternal immunologic system . Any abnormality attributed to the embryo, the endometrium or the immune system will result in implantation failure. Therefore, in assessing Repeated implantation failure, the embryo should be evaluated, with reference to the uterus and its functional endometrium. Accordingly, treatment of repeated implantation failure should be targeted to the abnormality detected, and the correction of any potential malfunction that might contribute to the failure of implantation. 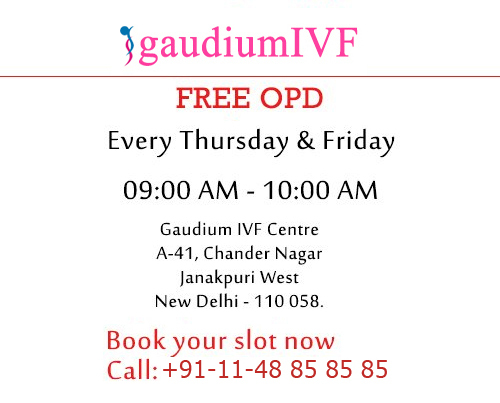 According to our Gaudium IVF definition, and following three consecutive IVF failures, patients should undergo hysteroscopy to assess the uterine cavity. Three dimensional ultrasonographies, as well as hysterosalpingography, are complimentary tools to be performed as needed. Once an abnormality associated with implantation failure is recognized, treatment options should be considered to include uterine septectomy, removal of intra-uterine adhesions, endometrial polypectomy or myomectomy (particularly the submucous type), and excision of hydrosalpinx. Thin unresponsive endometrium is hart to manage, and if all available treatments (i.e. high does estrogen, the application of vaginal estrogen pills, aspirin and other medications that may increase blood flow to the endometrium, and mechanical endometrial stimulation by mean biopsy sampling) fail, then surrogacy is a reasonable option. In recurrent miscarriages, patients are advised to undergo blood tests for thrombophilia as well as for connective tissue diseases that involve antiphospholipide antibodies.